A dishonest beauty rec can have pretty serious consequences — we've walked out of a highly lauded mani-pedi place with a nasty infection and a "swanky" Rodeo salon with neon locks (punk wasn't the look we had envisioned). Needless to say, informed decisions on where to drop your makeover dough are key. Well, lucky for you, we've got brains and braun to spare and are happily opening up our authoritative little black books to simplify your get-posh process. From the most flawless spray tan in town to L.A.'s updo guru, this spot-on handbook to hot has every expert you need to know now. This coiff queen has such a hard-core cult following of editors on both coasts that patrons have been dubbed "Shinheads." When the NYC transplant chopped off six inches of our hair, the bob was so flawless that we didn't need a retouch trim in a solid three months (and for once didn't shed a tear!). Even just watching Shin in action (she cuts dry only), will make you an instant believer — the soulful stylist has shear-ly mastered the craft of cuts. Shin Salon, 1025 Montana Avenue (between 10th and 11th streets); 310-310-3128. Carla Ross is one spunky (and skilled) redhead! She recently set up her own shop in one of the most state-of-the-art salons we've seen, and has been an educator and consultant for countless salons 'round the globe. What we appreciate most? Amidst funny anecdotes, she'll analyze your head size, face shape, and personality before going to town on your tresses. Slash Salon, 621 Broadway (near 7th Street); 310-341-0610. Some girls see their curlicued strands as a curse (baffling to us stick straight ladies! ), but Ouidad has built an empire giving those with the hair-type confidence. She's made waves since '84 with her "Carve & Slice" method of cutting (it's trademarked, folks), and we wouldn't dream of sending your loopy locks elsewhere in town. 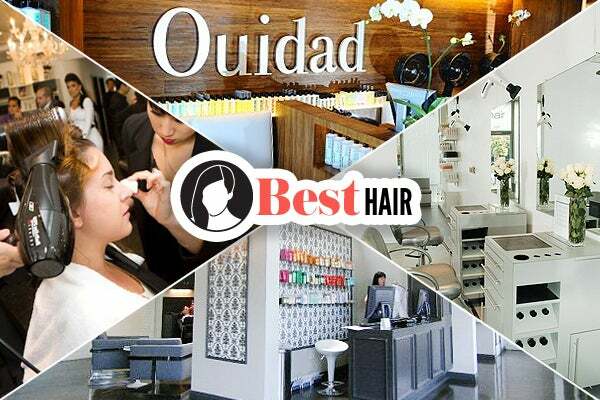 Ouidad Salon LA, 1230 Montana Avenue (near 14th Street); 310-393-3542. When a stylist has created looks for Beyoncé, RiRi, Sade, and the late, great Whitney Houston, what can you do except pray there's an opening in her books in the next century? Kim Kimble's name may be synonymous with Oprah appearances and cinematic productions like Dreamgirls, but the go-getter learned — and clearly climbed — the ropes from her days as a shampoo girl for her mother. Better plan well in advance for your tress session with this third-generation hair guru! Kimble Hair Studio, 1106 North La Cienega Boulevard (near North Holloway Drive); 310-652-1822. This "Beauty Express Bar" was birthed by two sisters whose social calendars kept them such busy bees that they knew there was a niche market for girls needing to get gussied up on the serious go. While your hair's getting a celeb-style smooth-over, you can sit pretty while more pros tend to your mani, pedi, and makeup — all in an hour flat. Style Bar Beverly Hills, 136 South Beverly Drive (between Wilshire and Charleville boulevards); 310-858-2400. No one does bombshell blonde like Ms. Stokes! And she's no one-trick pony, either. We can't count how many fair-haired girls about town see her, and their heads' hues range from full-on platinum to brilliant beach ombré. And if you're going to sit for hours in anyone's chair, you'll be stoked to find that she can chat life philosophies just as well as she can style. Pure sunshine on all fronts! Neil George Salon, 9320 Civic Center Drive (near Santa Monica Boulevard); 310-275-2808.
Who hasn't wondered where tip-top towhead Michelle Williams scores that luminous flaxen shade? Well, look no further than this stylist, who's been in the biz for 15 years at just about every major salon. Kari can balyage blonde with the best of them, but has plenty of brunettes in her back pocket, too (she recently dolled-up Mila Kunis for Comic-Con). Hill brings world-class color right to her little nook on Melrose Place. Serge Normant at John Frieda Salon, 8440 Melrose Place (between North Alfred Street and North Croft Avenue); 323-653-4040. Not all hair stylists know every trick in the book, and as far as we're concerned, you've got to have true artistic ability to pull off a killer updo. People freak over Kamie because she can whip up a traditional red-carpet chignon as well as making the tougher "undone" look stay in its rightful place (until you're ready to un-bobby). Did we mention she can braid?! Warren-Tricomi Salon, 8327 Melrose Avenue (at North Flores Street); 323-651-4545. Next time you're in a mad dash, we recommend you snag a quick bang job by these edgy experts. Since they specialize in tricky rocker and retro styles, the gals at Goodhead can get you trimmed in a cinch (and fix any past snafus)! For an added pep in your step, the down-to-earth Echo Park digs always has an adorable pup named Tank running around. Goodhead Salon, 1527 West Sunset Boulevard (at Laveta Terrace); 323-580-3282. Ascending the elevator from the scenester resto Trés by José Andrés up to the Ciel Spa is like night and day — its all white and serene atmosphere couldn't evoke a more different feeling than the cocktails chugged below. We've yet to have a facial here and not fall asleep! Plus, as if it gets any better than that, when you awake from your deep slumber and take a peek in the mirror, it's like someone gave you a new set of skin. Ciel just added one of our highly coveted skin-care lines, Eve Lom, to its roster of products, too. Ciel Spa at SLS, 465 La Cienega Boulevard (near South San Vicente Boulevard); 310-246-5560. The techniques used at this WeHo haven have been the exact same since '72. While that may be alarming to some, owner Paul and Tony's simple, thorough techniques (galvanic currents and manual extractions) have launched a full-on Angeleno phenomenon for a reason. If you still need convincing, Mary Louise Parker and Sofia Coppola have been dewy devotees for years. Face Place, 8701 Santa Monica Boulevard (at Santa Monica Boulevard); 310-855-1150. Led by one of Lala's premiere plastic surgeons, DMH is one of those hidden gems that celebs go to for their "special sauce" — but totally on the DL. With a full menu of futuristic and classic non-invasive procedures, we dare you to come here and find a problem area they can't somehow fix! A friend of R29 recently tried the Coolsculpting (it basically freezes fat) post-pregnancy and has not a love handle in sight. DMH Aesthetics, 111 North Larchmont Boulevard (at Beverly Boulevard); 323-450-9234. We'd never pass judgment on anyone who's relied on a youth-preserving dermo to fill 'er up — but please know we're not urging you to, either! If you've given your wrinkles real thought and decide to get some 'tox, Dr. Vicki is the lady to see. She takes precautions like having you furrow your brow and smile your widest, which ensures you'll leave bright-eyed and bushy-tailed rather than deer-in-headlights. SKN BAR, 436 North Bedford Drive, #306 (near Brighton Way); 310-274-4401. Spray tans may be a dime-a-dozen in our age-obsessed, sun-scared town, but when you're dropping this pretty of a penny, you want to make sure it shines! We could gush about Infinity Sun's faux glow until we're blue (err, brown) in the face! There's no Oompa Loompa-like orange to fret over the first day, it lasts longer than any bronze we've ever had, and it won't wear off in odd, scaly chunks. You'll be straight-up sun-kissed after one trip. When a trip up North to the Ojai Valley Inn just isn't in the cards, the best staycation-type spa is right on Santa Monica Boulevard. Hole up at Voda with your mags in between multiple treatments inside the massive indoor pool and jacuzzi room for real City of Angels-style rejuvenation. Grab a 'tini or two, too, at the adjacent cocktail lounge! Voda Spa, 7770 Santa Monica Boulevard (at North Stanley Avenue); 323-654-4411. It may be on the spend-y side, but this bliss factory is so unbelievably luxe, it's worth every cent.You can meet your man in the middle in the breathtaking "bath house" centerpiece, and any treatment grants you access to the pool, gym, and babysitting privileges to boot! Through September 30th, treat yourself to the Summer Ready Package complete with a 60-minute personal training session, mani-pedi or massage, and a credit towards a yummy rooftop lunch — all for $295. Like we said, totally worth the trip and the Benjamins. Spa Montage, 225 North Canon Drive (near North Beverly Drive); 310-860-7840. Does the doozy of a week you've just had earn you an over-the-top J.Lo-status spoiling? Well, it doesn't get more glam than the exclusive Natura Bissé Diamond Collection treatments at the Four Seasons. They'll soak your skin in diamond dust for the ultimate in ostentatious anti-aging procedures ($800 bucks for three icy hours). After your skin's been blinged-out, be sure to hit the steam room with its constellation of LED stars twinkling at the top. Spa at the Beverly Wilshire Four Seasons, 9500 Wilshire Boulevard (near North Beverly Drive); 310-275-5200. When you want to get wacky in this town, you know it isn't going to come cheap! For $1K, the therapists at the crazy chic, freshly revamped Hotel Bel-Air will rub golden bubbles of caviar all over your visage to brighten up any splotchy spots from sun damage. The La Prairie-product-packed facial is egg-cellent for any post-summer skin woes, and a great solution if IPL lasers aren't your thing. Hotel Bel-Air Spa by La Prairie, 701 Stone Canyon Road (near Bellagio Road); 310-472-1211. We've gone to the famous R.N. Rand Rusher for years for a variety of aesthetic odds and ends, but the LHR here will seriously leave you sans a single patch of fuzz. And unlike other places we've tried over and over again, you really only need three trips for it to stick! Rand Rusher, 416 North Bedford Drive (near North Camden Drive); 310-275-7263. For a mere 20 fun tickets, you can get a klieg-light catching face at Blushington. Many starlets trust Stephi Maron's Sunset Strip spot when they have to jet to an event and can't book their main squeeze. For a full affordable dream-team effect, head to neighboring Drybar next, where they'll get your head rockstar-ready (and hand you a glass of vino, too!). Blushington, 8591 Sunset Boulevard (near Sunset Plaza Drive); 310-652-5874. 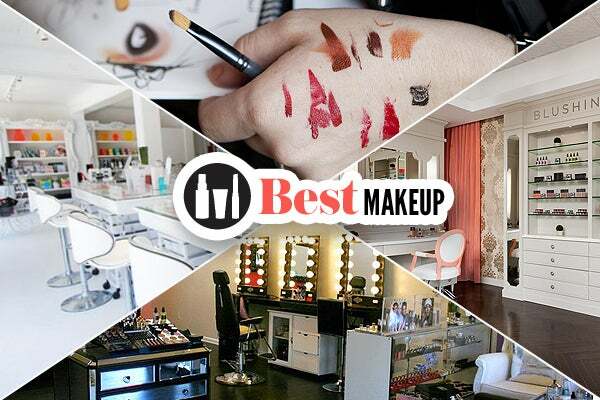 Best Makeup Application: Makeup and GO! Makeup and GO! is also conveniently located — you'll find it right next to BUBBLE Blow Dry on San Vicente, so you can bop around with ease before your big-night-out costume change. They use airbrush foundations for an immaculate base, and we love that every artist is in-the-know about current catwalk looks. Makeup and GO!, 13038 San Vicente Boulevard (at South 26th Street); 310-451-6253. We've taken part in so many wedding fêtes that it's bordering on 27 Dresses pathetic! That's why choosing just one artist for this category proved too tough to do. We adore RonAnn Myers because she fits right in backstage — she's seriously the toast of any bridal party (we asked her to stay for the reception — and she got down on the dance floor!). The bubbly blonde will take her talented technique on the road, too, for all of you destination damsels in distress. Makeup by RonAnn, no address, 310-710-6443. With 20 years under his belt, Bulmaro Garcia has worked with plenty of brides — but you'll also find real princesses, rockers, and Hollywood's elite in his bulging portfolio. His expertise with elite oomph can take you to va-va-voom "I do" or softly virtuous aisle-style. Bulmaro Garcia, no address, 310-990-6257. Getting waxed may seem like one of those annoying upkeep chores — until you meet the ever-sweet Marisa. She morphed our brows from post-college Pam Anderson thin to just the right amount of eye-framing bush. We can solemnly swear that no one has been allowed to touch that line but her in ten years. There's never been a need to cheat! Wax, 7924 Melrose Avenue (near North Fairfax Avenue); 323-951-9616. It may be hard for any young lass to remember the time before breezy makeup studios hit every 'hood, but back in the day, your skin's only secret weapon was who you knew at the beauty counter. We've grown so accustomed to the MAC gals' artful knack that they dolled us up for both the Golden Globes and the Oscars this year. If you're in need of product, we still highly suggest this route to going pro. Bloomingdale’s at the Century City Shopping Center, 10250 Santa Monica Boulevard (near Avenue of the Stars); 310-772-2100. While we're big fans of super-easy shopping at spots like Ulta and Sephora, sometimes, we're looking for something a little more...surprising. If you want to uncover that new sophisticated brand out of Stockholm, or wow a cosmetic-fiend friend with a treat she's never seen, you'll be over the moon for Woodley and Bunny's beauty booty. We almost get excited when we run out of our beloved Sachajuan Volume Powder now because it surely means a journey inside the Brooklyn-based emporium! Woodley and Bunny, 8318 1/2 West Third Street (near South Sweetzer Avenue); 323-951-9906. Makeup Mandy's extensions will make you want to bid adieu to your mascara forever. The LAshX Mink individual lashes are so solid you won't even have to give the falsies another thought for six to eight weeks. Founder Amanda Jacobellis actually trademarked her application method to the luxury brand, and believes that the product can stimulate growth for your god-given set. Flutter and wink away! Makeup Mandy, 8441 Melrose Avenue (between North Croft Avenue and Clinton Street); 310-858-1970. Diane, the owner of this unpretentious Robertson outpost, has been our friend longer than most of our BFFs can even claim — she really makes the extra effort to make you feel like family. Her technicians are so skillfully trained that they'll get you out of there in a jiffy (without looking like a preschooler painted your nails). For an extra treat, ask for Aida's chair massage, we guarantee you'll end up lounging long after the polish dries! Contempo Nails, 333 South Robertson Boulevard (between Gregory Way and West Olympic Boulevard); 310-855-8879. We first discovered this West L.A. oasis when they added the trendy Caviar Mani to the menu (they'll apply the fishy 3-D laquer in any color). While we were totally wowed by our fashion-plated fingers, the pedi is what really blew us away — it lasted two weeks, even after two trips to the beach! You can tell the husband-wife proprietors are spa junkies because they just get what an urban retreat actually means, down to the very last detail. 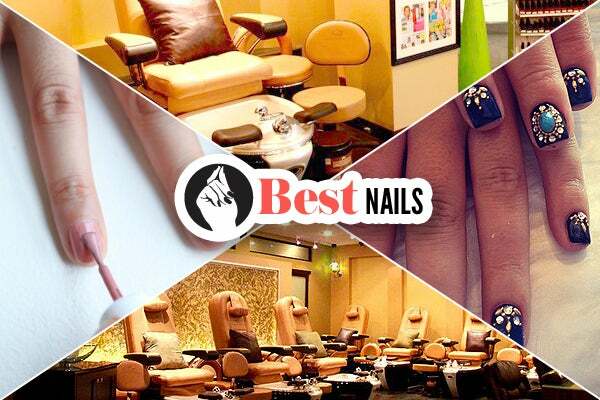 Nail Garden, 11677 San Vicente Boulevard #112 (near South Barrington Avenue); 310-979-0808. If you're wanting funked-up phalanges, then head to esNail on Melrose for an eye-popping array of unique stick-ons and out-there digit décor. Katy Perry and Gaga have both had designs done for them by the leading Japanese salon (es just hopped the pond in March), so you can be sure you're in good hands. esNail, 8384 Melrose Avenue (at Santa Monica Boulevard); 323-655-5800.